Labor Day is always the unofficial end of summer here on the lake. Most of the summer cottage people pack up their stuff, pull their boats out of the water, and bring their docks in for the year. It gets very quiet out here on the lake. Which is kind of nice after the busy summer season. Now that it’s September, I feel like it’s totally acceptable to start sharing some fall fun. Starting with my burgundy and purple Fall flower boxes. After the long weekend, my house is a disaster! We have no food or clean laundry, but I had the itch to dig in the dirt today. So, I’m ignoring all those boring chores, and I hit up my favorite local nursery to pick up some fall flowers. I mentioned last week I don’t love orange, so I decided to stick with the burgundy and purple fall flower box theme again. Also someone please share their window washing tips with me because mine are a mess. My son likes to be my gardening assistant, which means most of the water hits the windows instead of the flowers. If you follow me on instagram, I shared in stories how I keep the creeping jenny (the green stuff) from the summer. I pull out the leggy overgrown petunias and impatiens. Just use a small trowel and carefully try to separate the roots. I also trim the creeping jenny back a bit with a scissors. I kept those little white and purple flowers as well. Which one of my brilliant readers informed me were called Torenia, because I couldn’t remember. These purple Calibrachoa are a new addition for a bit more color. I love playing around with my window boxes, and so far this has been a fun change. Here is a sneak peek of what I’m working on for the rest of the front porch. I’m still on the hunt for pumpkins, so I won’t be sharing the rest for a few weeks yet. I have new pillow covers and a rug in the works too, so stay tuned! I love your non-traditional Fall color window boxes. 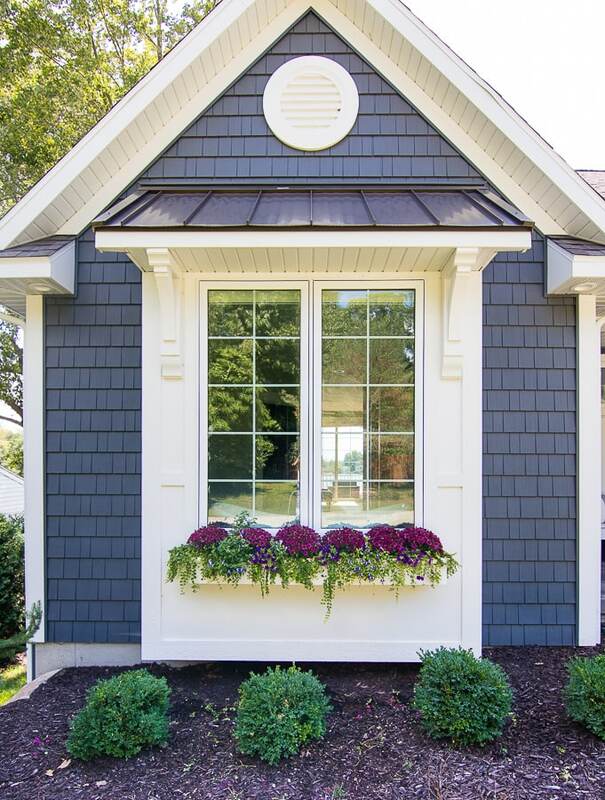 The flower colors go so well with the color of your house’s siding. 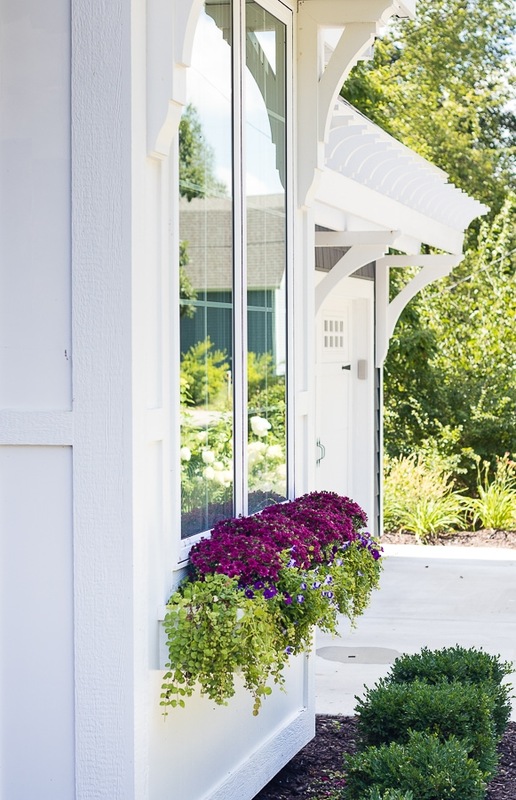 Looking forward to seeing the full reveal of your house decked out with pumpkins and flowers on the porch. Laundry is in good shape… but no food in the house… a grocery store visit is a must! I’m heading to the grocery store later this morning, the lunches I packed my kids today were interesting lol. 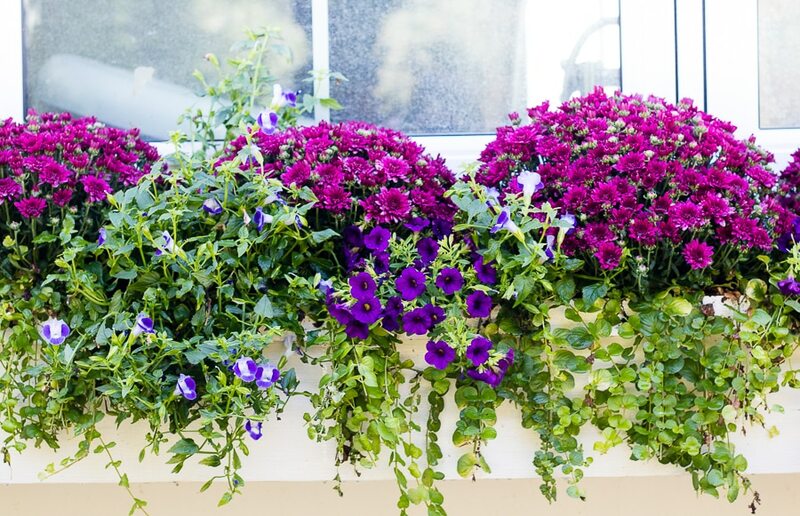 Your window boxes are stunning, Kelly! You certainly chose beautiful fall colors! My brother-in-law made me two boxes out of shutters. They are so cute, and coastal. I’ll certainly be heading toward the garden center today. Don’t fret about your laundry/food situation. You’ll get it done when you feel like it sometime today! Oh that sounds so fun! Have a great time at the nursery! Stunning! Looking forward to more fall inspiration. Love your home. Thx for sharing! LOVE the colors. So pretty. 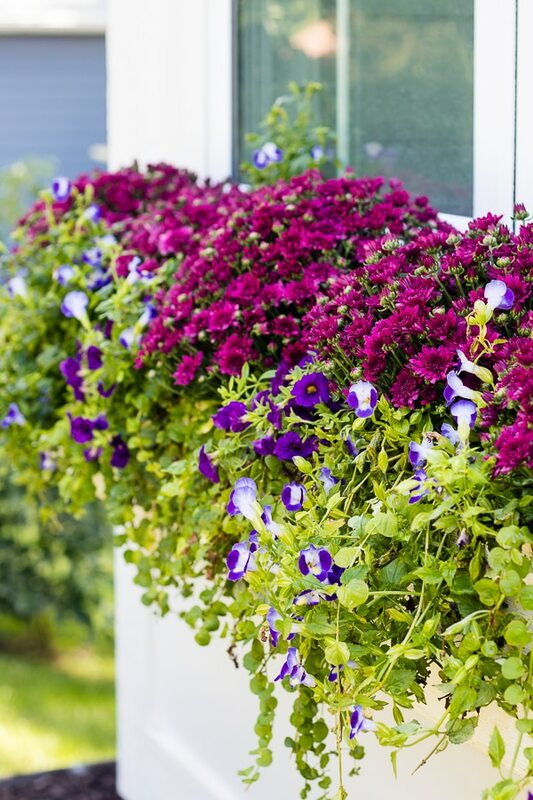 Your window boxes are what attracted me to you blog way back when and they do not disappoint this year – beautiful! To clean your windows, buy the outdoor windex that you put on the end of your hose. Works great. I am so glad I saw your post this morning, I just took my buntings down yesterday and moved a beautiful hanging basket I have had from early spring with creeping Jenny and begonia’s and other beautiful annuals on our front porch to our back porch. I didn’t want to throw them away yet, they have done so well this year. I have two rod iron planters with copper inserts that are overflowing with impatience and also have torenia flower I added to my planters on each side of my front doors as a filler, I know where they are going now. This will be my project in another week since I’ll be out of town this coming weekend. I love your home on the lake and the color of your siding, you are always inspiring me. Have a great day. Gorgeous! Can’t wait to see the whole effect with the front porch. I love the use of the cabbage plants. Not a fan of orange myself! Your flowers look gorgeous! Can’t wait to see how it all comes together! The flower boxes are absolutely beautiful! I love the colors as well as the arrangement! Just stunning. I’m going to go for this look in mine. How long will your mums bloom? I live in Florida and usually they are very short lived by turning black in the middle of the bloom and just never opening. Great inspiration, thank you. Mine usually last until we have a hard frost or if I remember to cover them. I think they do better with the cooler temps up north here. 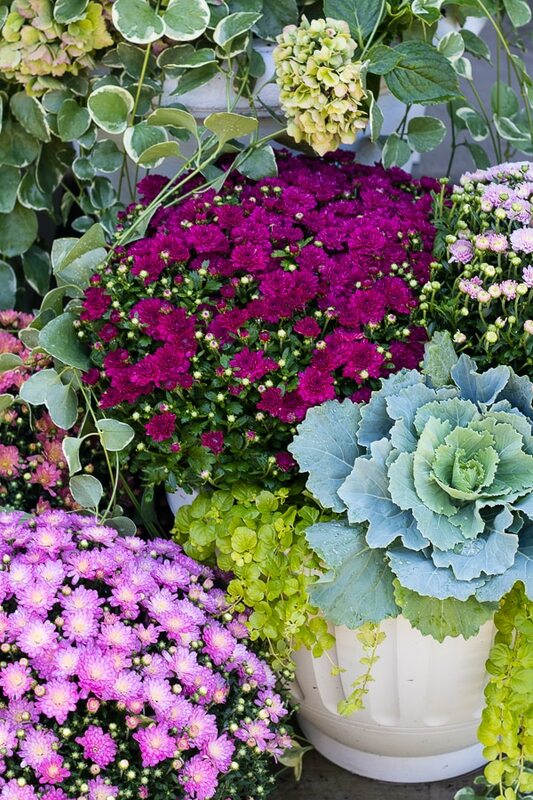 How do you cram so much into your flower boxes and pots? Is there any dirt in there? They look like they’ve been growing forever! Mine never look good until the season is almost over. It’s also frustrating to get things to grow here in Texas. Too hot for a lot of things. There is a bit of dirt in there ha! I really do just that cram everything in! I know you are “supposed” to give them room to spread out but I never do.